Located in Algonquin Park, the Beaver Pond Trail is a great spot to learn about Canada's national animal, the beaver. Along this 2 kilometer loop you will pass through some great Canadian wilderness including lakes, creeks, cliff tops and of course, beaver dams. Parking is located on Highway 60 near the kilometer 45 marker (N45 35.520 W078 20.405). The trail is has a wide range of difficulty so come prepared with comfortable hiking boots and lots of water. The trail head is located at the west side of the parking, be sure to grab a copy of the trail guide which includes a map and explanations of the numbered sign posts. You can borrow the guide book for free but if you wish to take it home there is a post where you can deposit $0.50. From here you'll cross the bridge to start the hike. Just across the bride is your first (and only) fork in the trail, you'll want to turn left as the trail to the right is where the hike will end. The first few hundred metres of the trail is downhill and quite rocky but will eventually open up to a great view of a beaver pond complete with a den. After the small lookout the trail turns into a boardwalk which allows you to cross the pond. From the boardwalk you can get some closer views of the pond to the right and the meadow to the left. The meadow is a good example of the ecological changes a beaver can make on the region. This area at one time was thick forest but after the dam was build and the area was flooded the tree died and became the base for the new meadow. This next part of the hike will bring you back into the forest which will follow the edge of the pond and eventually a small creek. It consists on a wide but rocky trail as well as a few sets of stairs. If you have not already applied the bug spray you might want to stop and do so now, this part of the hike is in a small valley with little air flow so the mosquitos are thick. After a few hundred metres you'll see a clearing on the left of a very impressive beaver dam. This is a great spot for a few distant pictures but the trail leads you to the edge where you can go in for some close-ups. From here you can see just how the dam works. Below is a tiny creek but above is a very large lake which is filled with many other dens. The next section of the trail will follow the lakes edge and eventually bring you out to a point with a nice panorama of the lake. The trail itself is a little more difficult at this point with a lot of up and downhill but it is quite a bit easier than what will come next. If you need a break or a drink of water I suggest taking a moment at one of the nice clearings along the lake. The next half kilometer of the hike is quite demanding as the trail climbs about 25 vertical metres away from the lake. The route is full of roots, rocks and poorly spaced steps but you're in for a treat once you get to the top as you get a fantastic view of the first beaver pond from high above. Watch your footing around the edge of the cliff as it is not fenced off. The trek ends with a simple downhill back to the bridge at the beginning of the hike. 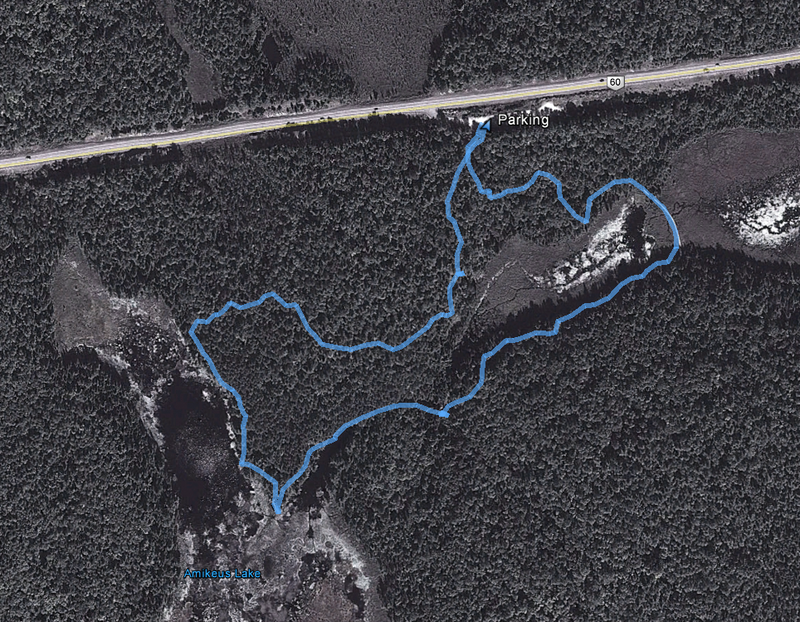 Beaver Pond Trail is a great walk for those looking for a challenge without hiking too far. The terrain has a great mix and the views are fantastic.